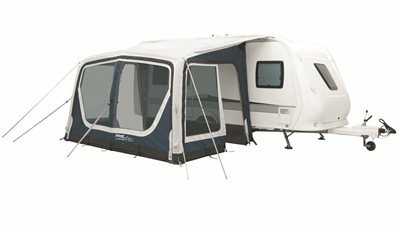 If you want a little more space from your caravan awning, the Outwell Ripple 380SA inflatable weekend awning is the one for you. The easy pitching air frame inflates into a 3.8x2.5m space, which offers plenty of room for cooking equipment, foldable table and chairs, bikes, and sports kit. On sunny days, fully unzip the front to welcome the sunshine. On wet days, the rainsafe entry and easy clean mudflaps will help to keep the interior dry and dirt free. Ideal for adventurous weekends away or longer breaks.